Late W115 diesel is the one for me outta that lot....Is it the one You were telling me about when I visited the first time? Lovely....Would love one of those! Honda 400 Four is considered somewhat of a classic nowadays....Always thought of them as a bike for girls of shortarses due to their diminutive size....Bit like the more recent Honda NC21/24/30 and Yamaha XV535 Virago Last time I had a bike tested (Guzzi 850 LeMans 1), was taken aback by just how cursory it seemed....But thinking 'bout it afterwards, a bike is far easier to check over than a car, as nothing's hidden....They checked tyres, brakes, forkseals, wheelbearings and headset....Guess that's what matters! Funnily enough I had my T3 850 Guzzi tested last week, it's a shed but it passed, it took the guy about 15 minutes in between sighs and fags! Ahh, the good ol' T3! My Dad had one of those fitted with a Lawson LE sidecar many moons ago....Quite a combination....But nowhere near as spectacular as the same sidecar fitted to a Mk2 LeMans that preceeded it!Suppose I have my Dad to blame for my perverse (and sometimes heartbreaking) love of Italian bikes....Japanese are far easier to own! Any chance of a pic of the T3 torsten? Have you & mk2_craig fallen out? That green van seems a bit modern to have been abandoned! I always think with the reversing lights on the Maestro.....why bother? ! They're barely there! Baz, I'll take a photo of the T3 tomorrow, I've got a lovely Morini 500 too on the Italian side, loads of Jap, Brit, BMW and East European too!Regie, my notes tend to read "for gods sake don't scrap this car, I love it already, my number is..."
Ah, poor old B11 Sunny. A 1.3GS facelift model, must be an early one to be on an A-plate (though just noticed it's got early front bumper retro-fitted). Had seen it around a few years ago, looked inside and had done 208K! 13" trim rings anybody? Might grab them for myself, one of my sets went on the 323 and there always handy for tarting up old steels when ghastly plastic covers have been removed. Lots of Cavaliers, Bluebirds and Primeras as they're heavily into racing. Out of place as it may look, this one was there and will probably end up on the track too. Unholy act being carried out between Nova van and pleasantly mouldy VW. Old AMC estate has been there for ages, strangely not raced and will probably be too rough even for that by now. That's me done for today, promise! The Sunny is pretty smart really considering it's probably lived a painful life. What's the badge on the grille? isn't the grille badge to celebrate 50 years of Datsun? It looks infinitely less a sack of turd than the one I briefly owned! Are we to assume that the first red Fiesta belonged to Pogweasel & that he was none too fond of it? Yeah, I bought it for about Ã‚Â£80 off eBay.... took it straight in for an MoT where the bloke promptly laughed at me (W*nker. That's all custom lost there! ).I was going to break it up, but it was in February and I am afraid of the cold LOL. Every time I went to move it so that I could get one of my nicer toys out it would expire in a new and irritating way. About 558 people said they would be interested in buying it off me, but at least 557 of them were irritating kids who 'would deffo have it, but will just have to check with their dad'..... i.e total fugging berks.So back on the bay it went!I try to blot the unfortunate incident out of my mind, as it's one of the few cars I didn't make any money on, and caused me a lot of grief with SWMBO at the time. 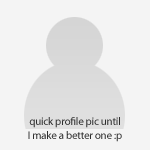 Not exactly 'me'. Amusing, however. Posted the X1/9/VDP combo before, they've been joined by more of Raymanboy's favourites and a wingless Minor. Quite late for one of these Starlets. Proper old! Haven't a clue what was under the tarp. Just near the office, hadn't seen it before. Can't recall if Baz posted this thing seen at the ECA auction? Weird chrome edging warrants two pic's of this 323F, a car I otherwise much admire through previous ownership of a rorty GT model. Rather clean C-plater seen on shopping duties. You like, MkII_Craig? Terrible pic, but this was the Civic that Wuvvum and I saw at the same place where my Accord came from down south. Also had a rather tidy looking W123 280 parked there. Don't seem to see many od these as coupe. Cool plates! Ponytail and glasses? It's a look Had a pleasant chat with the owner of this, he also has the Panda on X1/9 alloys I've posted previously (didn't mention this in case he thought I was stalking him). Not what I'd expect to find in Lidl on a winter's day. Marty-mobile. Looked very clean, proper Sid 'n Doris owners. See, not a great three weeks eh? Missed a few things seen from the bus in Norwich, like a nice P5B, Vitesse on Marina TC wheels and a cool old caravan. Oh, and a Lada with worryingly dim headlamps seen by Wuvvum and me on the way down to Crawley. Don't fight it. It is your destiny. 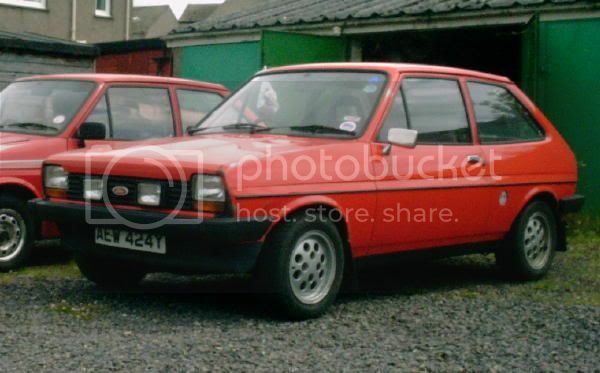 Perhaps I can hijack my own thread and relate a Mk2 Fiesta story here? 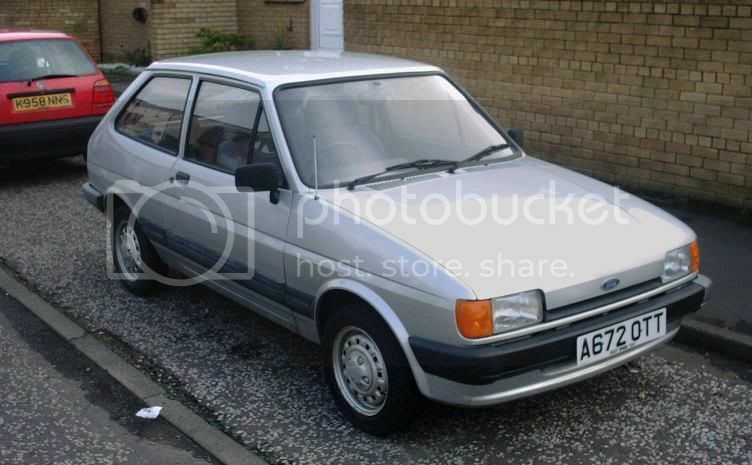 In 1992, on the day I was due to deliver my Manta 'A' Series which I had just sold, I drove into the back of such a Fiesta, an A-plate jobbie. 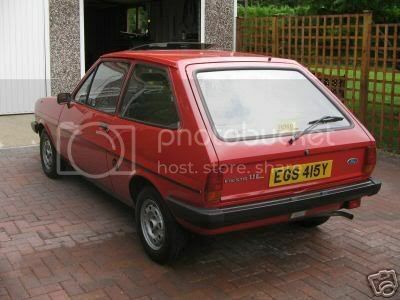 Fortunately Manta's pointy bumber was fine and sale went ahead OK, but I then had to sort repairing the Fiesta. They got a quote from a dealer of about Ã‚Â£200 to replace it (was only really the bumper), I said that sounded a bit much and would they mind me sorting a used one for them? They said yes, so I went to Springfield Autos near Sudbury and got one for Ã‚Â£6, then my garage fitted it and polished out the paintwork for Ã‚Â£24, so in all Ã‚Â£30!Funniest thing was that when I went to their house expecting to drive with them and then give them a lift home the lady said I'd got an honest face and I could drive the car I'd crashed into! So I did, and all was well. Got a photo somewhere, must dig it out (if only because I think there'll be a tatty Mk3 Cortina 2dr in the photo too).Oh, another update to follow shortly. My second attempt at this update. S13 model, sister to 200SX sold here but more attractive IMO. Nissan did some great cars at this point, but sadly most didn't come here. Bluebird T72 on S12 Silvia alloys, been like it at least since I saw it in Norwich back in 2002. S-Class seems to have replaced a 450SLC that I used to see at this place. This tidy P5B saloon, which was just up the road. This was in the same area as the P5B etc. Caught a glimpse of this from Park & Ride double decker at the weekend, wasn't actually sure what it was but it was worth the effort to find out! The tarp hides a lovely primrose yellow (faded?) Cavalier GL, been here for years now though covered only in the last couple of years. Maybe worth a note? I do like them, looked at buying a bright green 2000GLS years ago to replace the Manta. Another big Benz. Good excuse to explore the 'burbs, I have a fondness for areas like this. Tidy 230E, just round the corner from the above. What a find! Pleased enough to see a MkII, but with the comedy plate, bonnet mascot, wheeltrims etc? Fantastic. Just down the road from it was this tidy 728i. Very handsome car. Which site can you find out make of a car just from the registration? I want to know what happened to whatever towed it here. RAC? "Sorry, no matching registration number found. Please ensure you have typed it in correctly and try again, e.g. YG52 XCH." That's amazing! 1300 engine and NO previous owners according to RAC. Wonder what's on the clock? The number plates look like they're as old as the car or nearly so - doctoring the digits to "spell" a word is obviously not a new wheeze! OK who else thought the white Capri was just a very good photoshop from SL at first? - particularly the numberplate!WTF is on the bonnet? - is it an ice skater? Seems like a fair while since I've done an update, but the lucky find of a few today prompted me into action. The passenger door windows in these still upset me. Waaay too small. The 'granny drift' Sierra* seen from a different angle, finally tracked it down when stationary. Starting to get a bit tatty. 1977 pov-spec 1100 model with 14k on the clock, found at a house I went to survey. My boss is very interested in it, but it may end up at the next ECA auction. Mega-clean. This Clubman. Was in use until 2-3 years ago, but paint flat even then. Petrol station spy shot. Coincidentally not the first car I've seen recently with that colour scheme - see if you can guess the maroon and white hatchback from the same era. Picture to follow shortly, no peeking! Has Baz posted this before? Whatever, still a nice sight at B&Q. 4wd Transit a touch OTT for snack van duties at B&Q. This has been taunting me for years now, usually seen from the Park & Ride bus. Finally got round to photographing it, turns out to be a B-plate GLT. Maybe used to be a W123 M-B here too? Lotus graveyard! Lots of Elite and Eclat, the odd Excel and Esprit, also one or two older ones like Elan +2. Might be a handy source of those wheels. Dead Colt which appeared one day on the way to work. Just as I was pulling away a garage-owned Range Rover arrived to take it away. Very tidy Advantage, with that maroon and white colour scheme again. First I saw this moudering Cavalier estate. Same driveway also housed MkII Astra estate, Omega and something hidden behind the Cavalier. Then I noticed this Vitesse, and thought of Seth. Yep....And the County Transit! :wink:Volvo estate is just off Ipswich Road right? Been meaning to snap that, but You've saved me the bother....Do vaguely remember a Merc there once. Damn! Best I stick to the stuff in the sticks eh? Fine selection you've posted tonight!